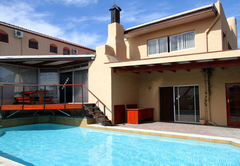 Ramasibi B&B is a Panorama Bed & Breakfast providing accommodation in 10 guest rooms for tourists visiting the Northern Suburbs region. Ramasibi Bed & Breakfast would like to offer you customer satisfaction in a home away from home where service is our focus. 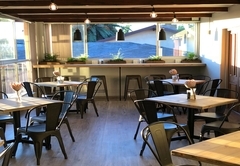 Ramasibi Bed & Breakfast consists of five bedrooms with four en-suites and the fifth room’s bathroom has been fully equipped for wheelchair patrons. 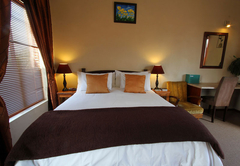 All rooms have tea/coffee facilities and TV with DSTV as well as WiFi. An honesty bar is available at the open plan area. Enter into a private garden with water feature which leads to the reception that has relaxing chairs in the waiting area. From the reception a stairway leads to the upstairs rooms, downstairs rooms and a spacious open plan lounge, dining room, TV room with DSTV and DVD player, indoor braai (fire & gas), bar. From the open plan area, a sliding door leads to a deck above the 11x4.5 metre swimming pool where one can have breakfast when weather permits it or relax under the cool thatched gazebo on the other side of the pool. 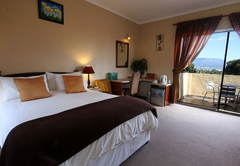 This double room features a queen size double bed with an east facing window for a view of Tygermountain as well as separate west facing balcony with the most stunning view of Table Mountain. Relax on the balcony or comfortable chair inside with coffee / tea facilities whilst watching TV including DSTV & MNET and WiFi. The room has a wall mounted fan, fitted heater and the en-suite bathroom consist of a bath with shower inside it, wash basin and toilet. 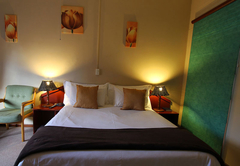 Two single beds or one king size double bed is offered with DSTV and MNET & WiFi as well as coffee/tea facilities with a wall mounted fan, fitted heater and the en-suite bathroom consist of a bath with shower inside it, wash basin and toilet. View part of Table Mountain from the west facing window and Tygermountain from the two separate windows facing the enclosed passage. 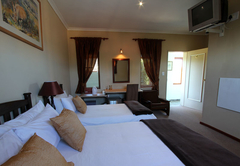 Two single beds or one king size double bed is offered with DSTV and MNET & WiFi as well as coffee/tea facilities with a wall mounted fan, fitted heater and the en-suite bathroom consist of a bath with shower inside it, wash basin and toilet. Enter this room with a picture perfect view of Table Mountain through the west facing window and Tygermountain from the two separate windows facing the enclosed passage. 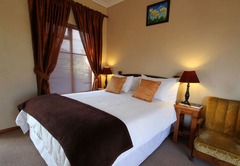 Two single beds or one king size double bed is offered with DSTV and MNET & WiFi as well as coffee/tea facilities with a wall mounted fan, fitted heater and the en-suite bathroom consist of a bath with shower inside it, wash basin and toilet. From this room a great view of Robben Island can be experienced from the west facing window and Tygermountain from the two separate windows facing the enclosed passage. This bedroom has a double bed and an east facing window view of Tygermountain. It has DSTV and MNET & WiFi with tea/coffee facilities in it. 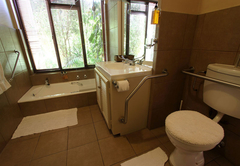 The en-suite bathroom has been equipped to cater for wheelchair guests with grab rails around the toilet and levers on the basin with a bath and shower inside it. 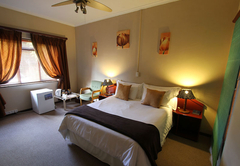 This room is also fitted with a ceiling fan and has a separate coiled oil heater for the cold Cape Town winters. Breakfast consist of a full English breakfast and can be extended on request. 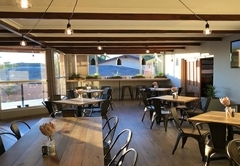 Ramasibi Bed & Breakfast is situated 750 metres from the N1 off ramp at the Plattekloof / McIntyre (M14) exit in the picturesque Northern Cape Town suburb of Panorama, Parow making it the ideal venue for business people as well as tourists. It is also 10 minutes away from Century City (Canal Walk) and Tygervalley shopping centres, 15 minutes from the airport and wine routes. 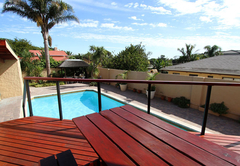 20 minutes from Cape Town and 30 minutes from a variety of beaches and Stellenbosch. 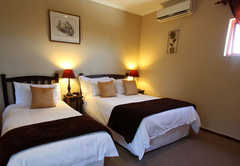 This room consists of one queen size double and one single bed and en-suite bathroom with shower over bath. 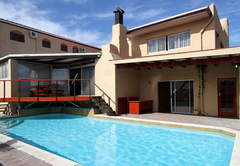 Beautiful views of Tyger Mountain and a balcony for spectacular view of Table Mountain & tea/coffee facilities & TV/DSTV. Aircon recently fitted. This room consists of one double bed and en-suite wheelchair friendly bathroom with shower over bath. 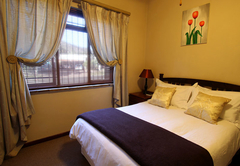 It has beautiful views of Tyger Mountain and includes ceiling fan, tea/coffee facilities, bar fridge and DSTV. 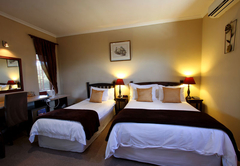 This room consists of one queen size double bed and en-suite bathroom with shower. 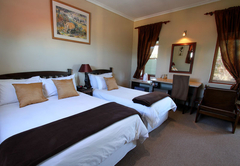 It has a small dressing table with beautiful views of both Table Mountain as well as Tyger Mountain. It has a ceiling fan, tea/coffee facilities, bar fridge and DSTV. This room consists of two single beds (or made up together as one king size double bed) and it's own private bathroom nextdoor with shower over bath. It has beautiful views of Tyger Mountain with ceiling fan, tea/coffee facilities, bar fridge and DSTV. Response timeRamasibi B&B typically responds to requests in 5-10 minutes.